HRC Launch Control: We're talking about a special ECU program here: push the button to select the mode, hold the throttle open, release the clutch, and the CRF450R will do the rest, launching you into the first turn with a big advantage. It turns your bike into a holeshot-seeking machine! 260 mm Front Brake: The CRF450R's large front-brake disc measures a whopping 260 mm. You get great brake feel and a pattern that cuts down on weight. Front and rear brake-disc guards are part of the package too. Lighter Overall Weight: We shaved an additional 795 g (1.75 lb) from this year's CRF450R—a surprise considering how light this bike already is. Where did it come from? Mostly from eliminating the kickstart option, but weight is weight, and on a racebike less of it is almost always better. Titanium Fuel Tank: Grams and performance count, and the CRF450R uses a titanium fuel tank. Light and strong, it's also thinner than our previous plastic unit, while maintaining the same capacity, freeing up more space and helping to centralize fuel mass. 449 cc Unicam Engine: Honda's Unicam cylinder heads combine the best of single and double-overhead-cam designs. The configuration contributes to a compact engine that saves weight over a comparable dual-overhead-camshaft motor and also permits a narrow included valve angle. This flattens the combustion chamber to facilitate ignition flame propagation, allowing a high compression ratio. Since less space is taken up in the cylinder head, the camshaft sits lower in the head for a more compact engine and a lower center of gravity. Downdraft Fuel Injection: The CRF450R features a downdraft intake tract and FI body to help increase both power and fuel-metering precision. It's part of the reason the CRF450R offers such explosive power and massive torque, especially out of the starting gate and in the critical first 30 meters (100 ft) of the race to the first turn. New Double-Spray Injector Settings: "The CRF450R's fuel-injection system sprays twice per intake cycle. That helps increase fuel atomization without adding the weight or complexity of a second injector. The better fuel atomization means more power in the midrange and on overrev—you'll feel it the first time you race. " New Longer Head Pipes: Lengthening the CRF450R's headpipes help give you better throttle response and top-end pull. Dunlop MX3S Tires: Developed using Dunlop's latest “block-on-block" design technology, the CRF450R's MX3S tires give excellent feedback and are a perfect complement to the CRF450R's frame and suspension. 13.5:1 Compression Ratio: The cylinder head of CRF450R features a refined squish area that helps boost compression to an impressive 13.5:1. That means improved combustion efficiency for more power. “In Mold" Graphics: With the all the time you'll be spending in victory circle, you need to look your best. The 2019 CRF450R has you covered. Our “in mold" graphics look great, and stay looking good longer. New Programmable ECU: Want to fine-tune your CRF450R's power delivery to a specific riding style or track? It's easier than ever with the 2019 CRF450R's programmable ECU. New Renthal® Fatbar®: The new aluminum Renthal® Fatbar® features a new bend too. The old Honda “CR" bend was legendary for getting it right, and this new fat bar is even better. It's the new standard of excellence—you're gonna love it! New Black Rims: They may not help you go faster, but the new black DID® rims this year sure look good. Next-Generation Aluminum Frame: The CRF450R's Next-Gen twin spar aluminum frame positions the rear shock's mounting point lower, opening up the airbox area and contributing to a lower center of gravity for more holeshots. The frame geometry also helps improve traction, feeling and steering precision. Showa Spring Fork: The 49 mm Showa fork features a conventional spring design that helps increase the CRF450R's front-suspension precision, handling and feel. The spring rate provides better bottoming resistance and improved handling. New Frame Members: We've stiffened up the CRF450R's chassis to work better with the new swingarm. At the same time, we took some rigidity out of the rear subframe, to help maintain the bike's overall balance and feel. New Swingarm: We've changed the way we build the CRF450R's swingarm this year, fine-tuning the flex to work with the new chassis and give you better rear traction and cornering precision. 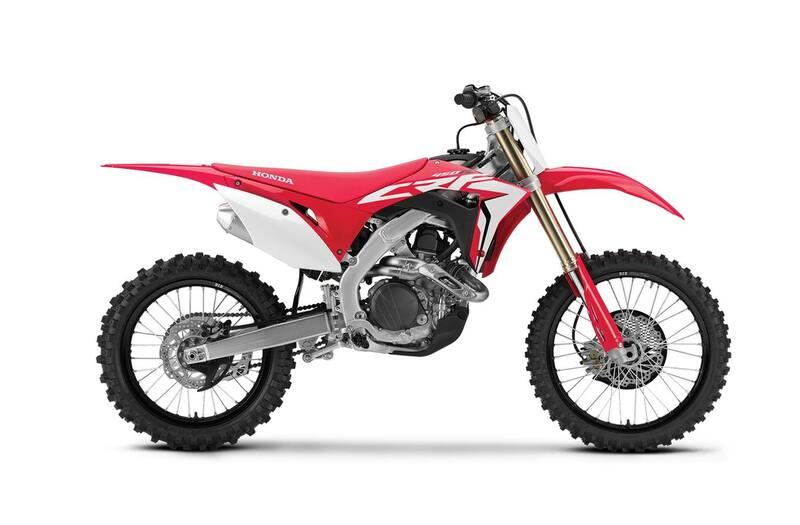 Twin-Muffler Exhaust System: The CRF450R's dual exhaust system is light, compact, and positioned close and low in the frame to take weight off the rear end and bring more mass to the bike's center for improved handling. It also allows for more air flow, and that equals added power.